High quality, heavy rug. It quickly flattened out after unwrapping. It does read as a lighter beige color, rather than the gold that I see in the pictures. 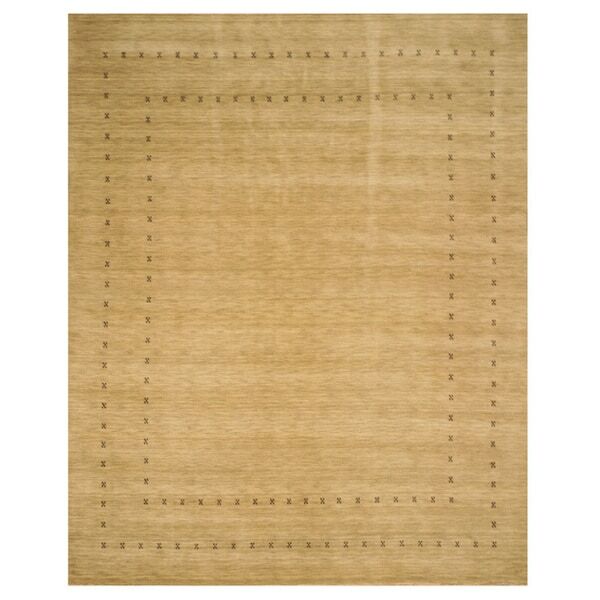 Bring a Southwestern vibe to any room with this Loribaft wool rug. Handmade from natural materials in a classic beige color, this rug matches your existing furniture and room decor. The understated border pattern adds a touch of visual interest, while the latex-free construction provides durable style for years to come. This rug is even more beautiful than it appears online and we love it. It's very soft underfoot and well made with what appears to be a high quality wool. It doesn't have a fabric backing to it (which I don't mind at all), so it slips easily on a hard surface floor; you'll definitely want to purchase a non-slip pad for it. I think that the quality is a good value for the price, and I would recommend this purchase to anyone. "What are the actual dimensions of ITEM#: 15847853 8x10 rug ?" This is approximately 8 feet x 10 feet.